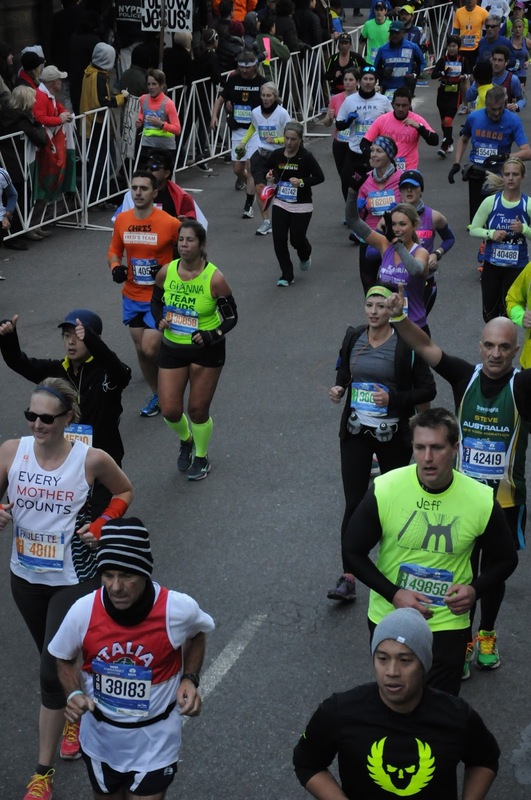 The New York City Marathon: wow. I've never run anything like it. There was so much crowd support along the entire route; if spectators were allowed to be there, they were there. We ran through all five boroughs, so I was able to see more of the city than ever before. I loved every minute of it. As I mentioned in the pre-race post, I slept very well the night before. The fall back time change was an added bonus because it gave me more sleep time before I had to head to the bus at 5:30 am. I woke up excited and nervous, got dressed, and headed out the door. Everything had been set out or packed in my start village bag the night before; I made sure I could wake up as late as possible. I wasn't starting to run until 10:30 am, so I knew I'd have plenty of time to prep and eat after arriving at the start village. Race morning was cold and windy. I went to the bus in three throwaway layers on top and one on the bottom, and I was worried it wouldn't be enough. The ride to Staten Island took longer than it should have with traffic, but that was fine with me because we were on a heated bus. The sooner we arrived, the sooner we were outside. After exiting the bus, I followed the herd of runners through security (metal detectors and bag check) and into the village. The start area was crowded with people sitting and laying on blankets or old race heat sheets, and they had covered the muddy grass with straw. Race morning at Central Park. As a charity runner, I was lucky to have access to the charity village which was much less crowded. We had tents over our head, although they didn't have walls so we still got the wind. I had a small cup of coffee and used hot water to make my usual race day oatmeal. We huddled together under our tent wrapped in heat sheets, blankets, plastic bags, and anything that might help block the wind. This sounds really terrible as I write it, but in reality it was cold but manageable. Having my EMC teammates there for support made all the difference. 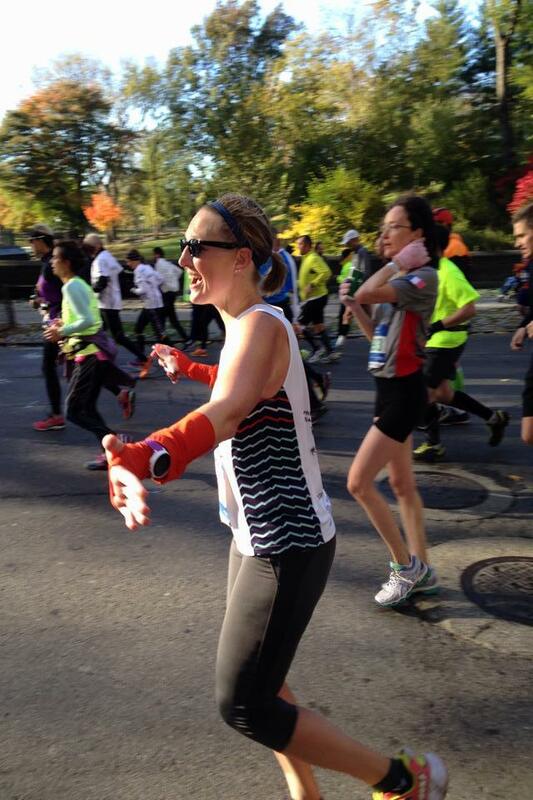 My biggest source of anxiety for NYCM was the wait time to start, and it wasn't nearly as bad as I expected. In fact, it went really quickly and fueling was fine. I had a Picky Bar on the bus, oatmeal shortly after we arrived, and half of a peanut butter sandwich closer to my start time. NYCM provided coffee, hot water, and bagels to all runners. Dunkin Donuts was handing out pink and orange fleece beanies, but I missed them in the start village and had a hood so wasn't too concerned. When they announced opening of the Wave 3 corrals, my stomach lurched. I hit the porta potty line once more and headed over. We had to be in the corral at least 30 minutes before our start time. I heard that some people who headed to the corrals near the 30 minute time were blocked out and made to start with the next wave; something to keep in mind if you run this one. I had no problems at all going over right when they opened and felt everything was very smooth. At 10:30 am we heard the gun go off and started moving toward the start line. I was in Orange Corral F, so it took me about 10 minutes to get to the start line itself at the entrance to the Verrazano Bridge. I turned to the person next to me and said 'This is going to be awesome!' He gave me an inquisitive look and said it was his first race of any distance ever. I told him how excited I was to run this marathon and for the crowds and how impressed I was that his first race was a marathon. That takes serious guts. We crossed the start and up the Verrazano Bridge we went. I expected this to feel like a big hill but it didn't, likely because I was preoccupied with not blowing over. The wind on the bridge was intense. There were times when my foot landed in a different place than I thought it would because the wind moved me. My ponytail was whipping around and the hair tie almost came out, so I wrapped the tie around my finger and grabbed a Dunkin Donuts beanie from the side of the road to tame my hair. Yes, I know I'm not supposed to pick up the donations but...it worked like a charm. I think the wind on the bridge is the worst I've run in, although I experienced some comparable wind at Big Sur Hurricane Point in 2012 and heavy wind+rain at CIM in 2012. The top of the bridge incline rewarded us with a jaw-dropping view of the New York City skyline. It was absolutely gorgeous. Once we came down the other side of the bridge, the wind situation improved. Don't get me wrong - there was still a lot of wind, but I think being a middle-of-the-pack runner in the crowd helped to block it. I can't imagine what it would have been like to be out there on your own or in the lead pack. I also suppose it's helpful to have the aforementioned bad race weather experiences in my past because I was able to draw on those memories to improve my mental state. I kept repeating to myself 'remember [insert bad weather memory here]? You can handle this.' We've all had our tough weather days, and I highly recommend this strategy for dealing with less-than-ideal weather. As soon as we left the bridge and entered Brooklyn, the crowds started. Brooklyn was out in droves to watch the race and everyone was cheering like crazy. We were in Brooklyn for a long time and I enjoyed the scenery and the people. I re-donated the Dunkin Donuts cap, put my hair back in a ponytail, and ditched my first layer of gloves. 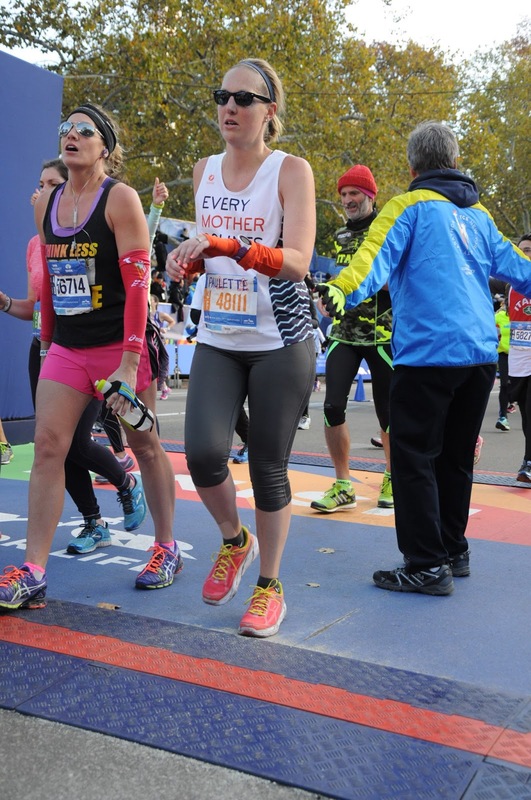 People were cheering for me by name (taped on) and by yelling 'Every Mother Counts' and I loved it. I tried to wave at each person who called out to me. The miles kept flying by and soon we were crossing the Queensboro Bridge, a very quiet and difficult part of the course. I was struggling but still moving along at a decent pace. Luckily, I came up on a guy wearing a Google shirt and discovered he also works in Mountain View, on the same overall team, and in my building. Go figure! We chatted for the rest of the bridge and into First Avenue until I lost him at a water stop. One of the bridges, funny face. The First Avenue crowds were the biggest and loudest yet, and they were right where I needed the encouragement. I usually hit a big 17 or 18 mile wall so I was expecting to feel awful, but the excitement kept me going this time and there was no wall. I knew I was approaching my cheering friends and was thrilled to see Kevin and Megan around this time. At around 101st and First Avenue, the Oiselle ladies were loud and awesome. That was the push I needed to stop worrying about why I hadn't hit a wall (was it still coming?) and to get to mile 20. The course headed into the Bronx where there were less people cheering but still way more than other races. I knew my friend Alisha was out with a sign for me around mile 20 and sadly I didn't see her, but knowing she was there and being distracted by looking for her helped me push through those miles. I was now solidly into the twenties and still hadn't hit the dreaded wall. We turned back toward Manhattan where we had to tackle a long, slow uphill around miles 22 and 23. This was another low point for me, but I saw the Oiselle cheering section again in this stretch and was incredibly happy to see them. I high-fived Beth and perked up, plus Stephanie got a few fun photos of me. Kevin and Megan were in this area too, but I missed them this time. OMG I'm so tired and so happy to see you guys! 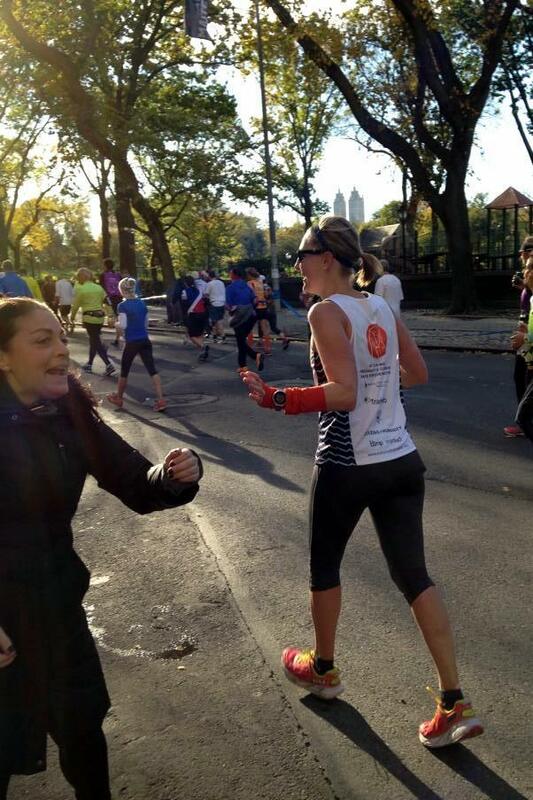 The next thing I knew were were turning into Central Park and we were within 2 miles of the finish. 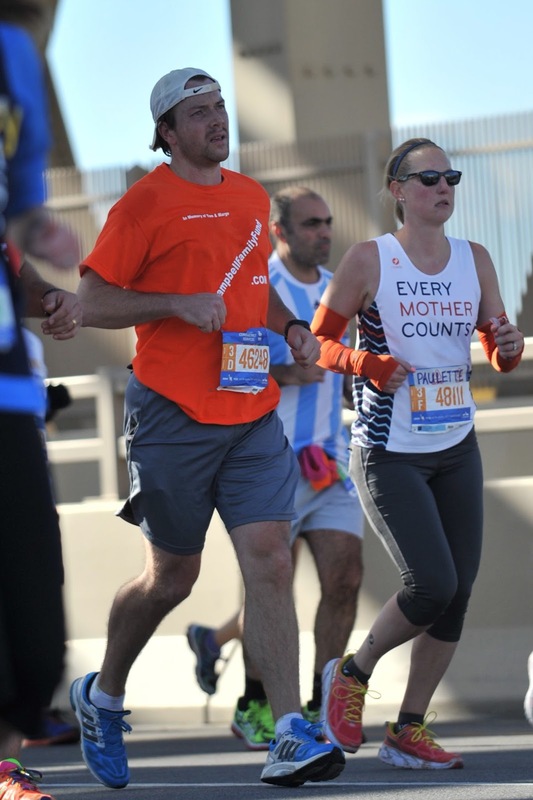 I still felt strong and hadn't started to do a walk-run like I have during each of my other marathons. That in itself was a huge accomplishment for me. Aside from quick water station walks to drink and one or two other 30 second walk breaks to eat, I ran. 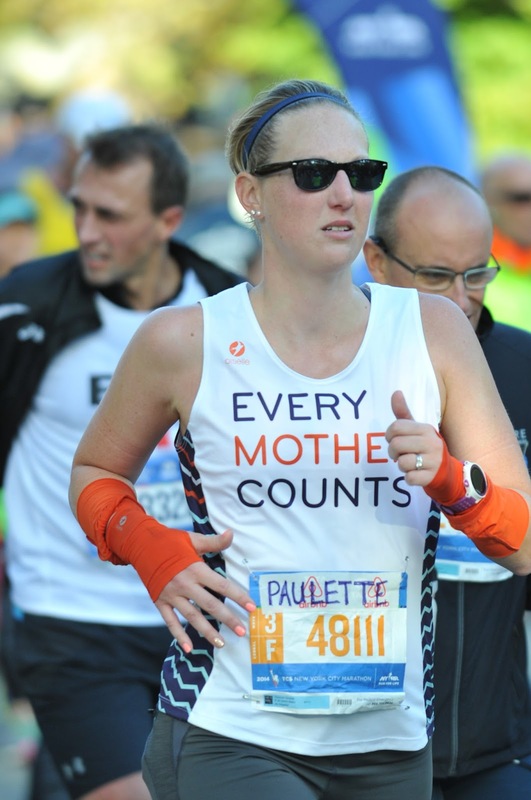 Anytime I thought I couldn't keep running, I thought about the women we were supporting with team EMC and kept pushing on. The next miles along Central Park were filled with even more people cheering, and finally we climbed the last small hill to the finish line. I did it! I ran 4:35:36. Although not a PR, this race was by far the strongest I've felt during a marathon and I'm thrilled. It's easily my favorite marathon so far both for the course and for how I felt running it. Big smile in the finish chute. After crossing the finish line, the crowd of runners kept moving slowly forward. We collected our medals and I remember saying to an amused volunteer 'It's so beautiful!' They handed us heat sheets and taped them so they would stay on. We each received a bag with food and drinks and I was pretty sure my shaking legs were going to give out while I waited a few minutes for that bag. At least after that I had Gatorade, water, and recovery drink to keep me going. Finish line on Friday, as seen during the Strava group run. Volunteers continued to usher us through the park, separating us based on if we had checked a gear bag or not. 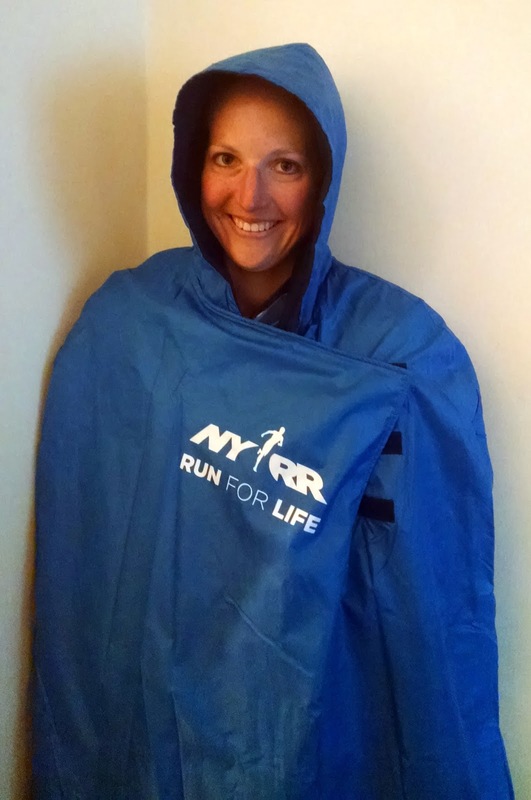 Runner who didn't check a bag would get a fleece poncho. I was very cold and it felt like we walked forever to get to the ponchos, but finally a volunteer wrapped me up in fleece and everything was so much better. I kept walking toward the family reunion area, where volunteers along the sides were keeping us moving and congratulating us. Bart Yasso was one of the people, and I stopped to say hi-remember-me-we-had-beer-together-in-SF. Surprisingly, I was the only one I even saw talk to him; he was pretty incognito in his race employee gear. He meets a ton of people and I know he probably doesn't remember me, but it was fun to say hi anyway. From there I continued through the crowded family area and met Kevin at our planned spot, a Starbucks on 58th Street. He took everything I was carrying and escorted me the last few blocks to our hotel. That was one LONG post-marathon walk; it took about an extra hour of slow walking to get from the finish line back to the hotel. Happy to be back at the (warm) hotel post-race. After I showered, we had a beer in the hotel, grabbed pizza by the slice, and then went to the theater to see Wicked. What a great show! I knew beforehand that it was related to the Wizard of Oz but nothing else about it, and I really enjoyed the story line and how it tied the two together. The course. 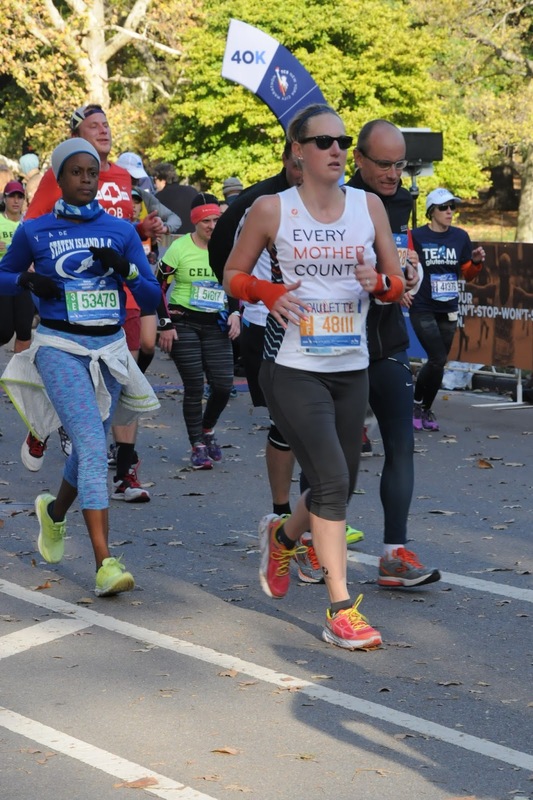 I loved running this course and seeing so much of NYC. It's not an easy course, which I'd been told but understand more now that I've run it. It isn't hilly compared to something like SF, but it has noticeable grades and many turns that will slow you down. Although I didn't feel crowded the whole time, there were many people to dodge and I was held up a few times for that reason especially in the last 10K. The crowds were amazing and lined almost the entire course, plus there were people with music, marching bands, and jazz bands out to entertain us. The support. I give this race an A+ for support! They had porta potties about every mile and water/Gatorade stations at a similar frequency. I took water at every other station because I didn't need it every time. They handed out Clif gels at mile 18 and bananas at each aid station for the last 6 miles or so. The fluid stations were on both sides of the road and long, so they weren't as congested as I would have expected for such a big event. The finish line. The finish line was very organized, but runners moved through very slowly. They had told us to expect 30-45 minutes from finish to exiting Central Park and it definitely took that long. I loved that they taped the heat sheets on us and everyone was very nice and helpful. 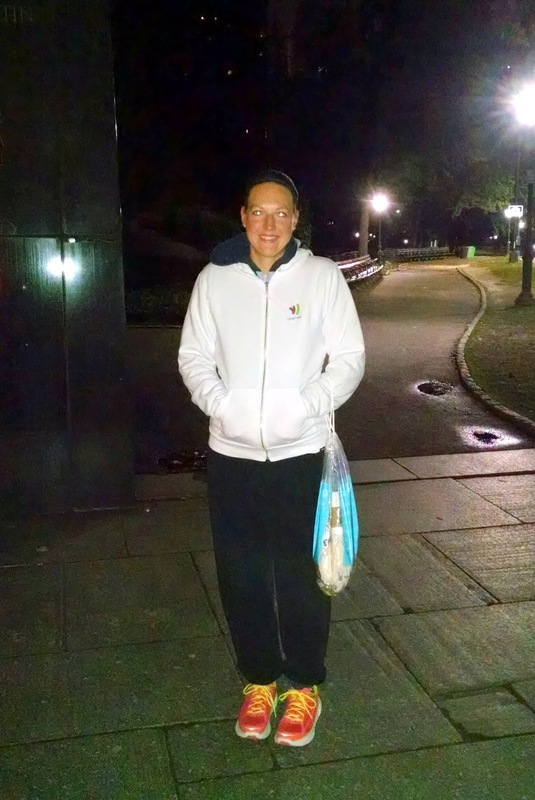 The food bags included water, Gatorade, recovery drink, an apple, pretzels, and a Power Bar. Getting from our park exit to the family reunion area took a few more minutes of walking, and the family area was very crowded. I'm glad Kevin and I picked a meeting spot away from there for that reason. The swag. 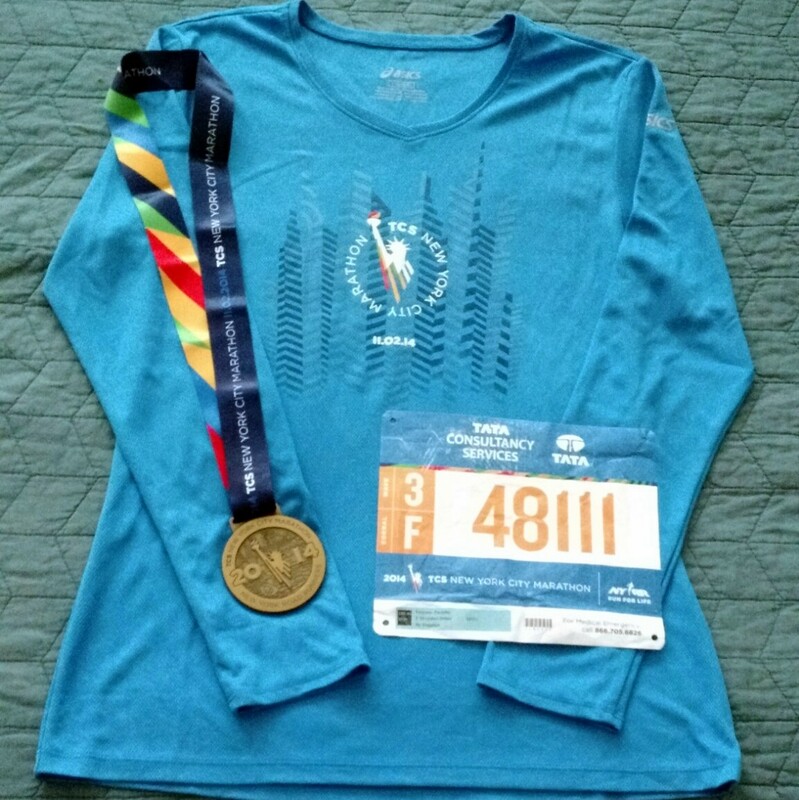 The race shirts were long sleeve Asics shirts and I love the colorful ribbon on the medals. 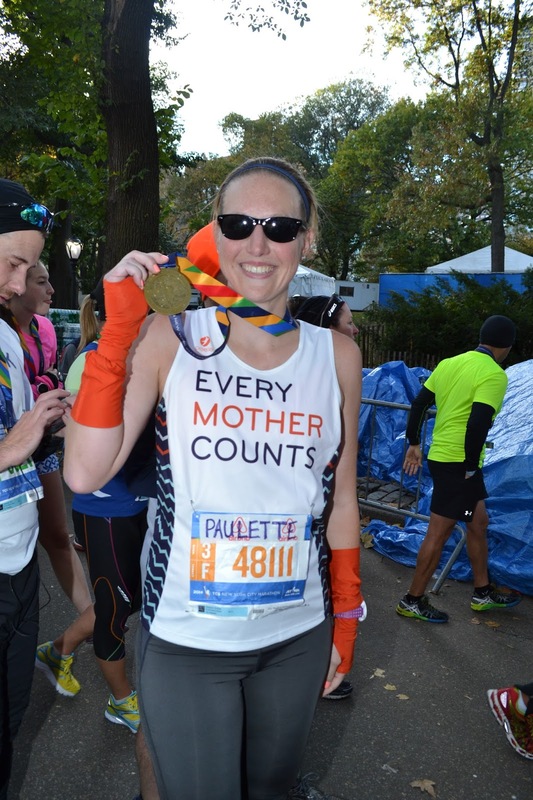 It's hard to believe my marathon goal race is over for this year! I'll be glad to change up the workout routine a bit and to take some recovery time. Happy running! So glad you had a wonderful run and experience in NYC! It was awesome cheering on the sidelines for ya! Congrats! Thanks and thanks again for being there! I loved it! fantastic! you make me want to run! Me too - so great to hang out! Thanks again for being there! Oh congratulations, I loved this recap. So happy for you - I'd love to run this race! I'd come out of marathon retirement for it! How were the Cliftons? As soon as I can get myself to a shop to try them, they're coming home with me. I'm kind of obsessed with the thought of them!! I highly recommend this marathon! I'm addicted to it now. :) I love the Cliftons, they have been awesome throughout the training cycle and for the marathon. Definitely check them out! Congrats on a strong race and great experience! Such a great race recap...congratulations!!! Congrats and yay for a strong race! Enjoy your recovery! 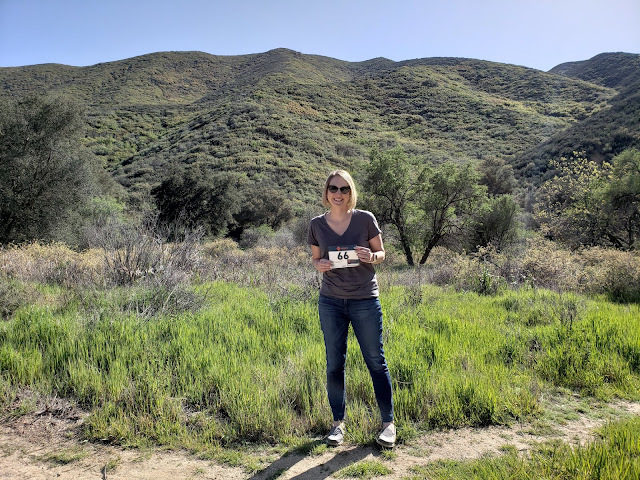 Bummed that I missed you, but so glad to read about your awesome experience -- I loved it too! Summit Rock, any chance? Aww, I'm so glad you had a great race! 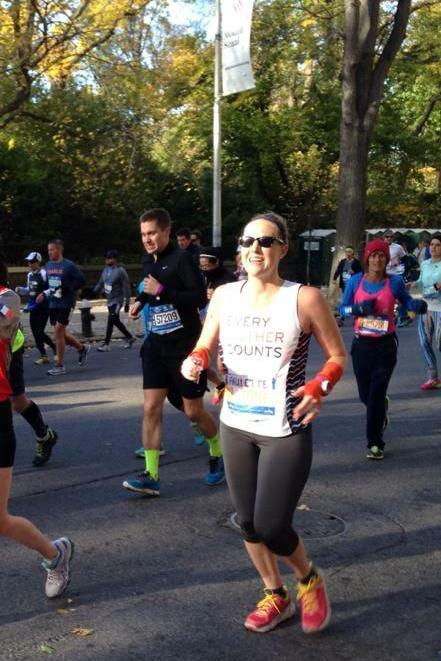 It makes me sad when people run NYCM and have a bad day, because the race is just so amazing on so many levels. I really hope that guy running his first-ever race also had a good day. That's so crazy! 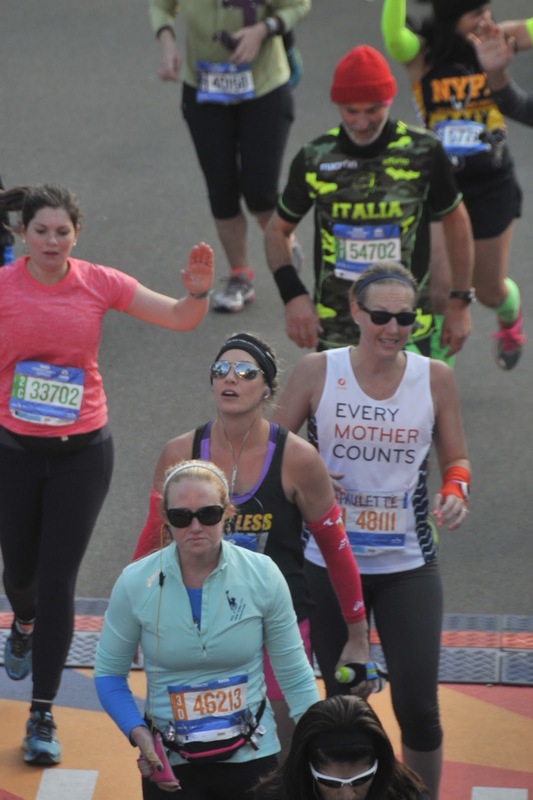 FINALLY got around to reading your marathon recap. Really makes me miss running :) But amazing job! No running? Not hitting the wall?? That's absolutely fantastic. Such a great race for you. Congrats on hitting your goal race and powering through it :) Very happy for you!